In 1619, America’s first marijuana law was enacted at Jamestown Colony, Virginia, “ordering” all farmers to “make tryal of “(grow) Indian hempseed. More mandatory (must-grow) hemp cultivation laws were enacted in Massachusetts in 1631, in Connecticut in 1632 and in the Chesapeake Colonies into the mid-1700s. Even in England, the much-sought-after prize of full British citizenship was bestowed by a decree of the crown on foreigners who would grow cannabis, and fines were often levied against those who refused. You could even be jailed in America for not growing cannabis during several periods of shortage, e.g., in Virginia between 1763 and 1767. George Washington and Thomas Jefferson grew cannabis on their plantations. Jefferson,3 while envoy to France, went to great expense, and even considerable risk to himself and his secret agents, to procure particularly good hempseeds smuggled illegally into Turkey from China. The Chinese Mandarins (political rulers) so valued their hemp seed that they made its exportation a capital offense. 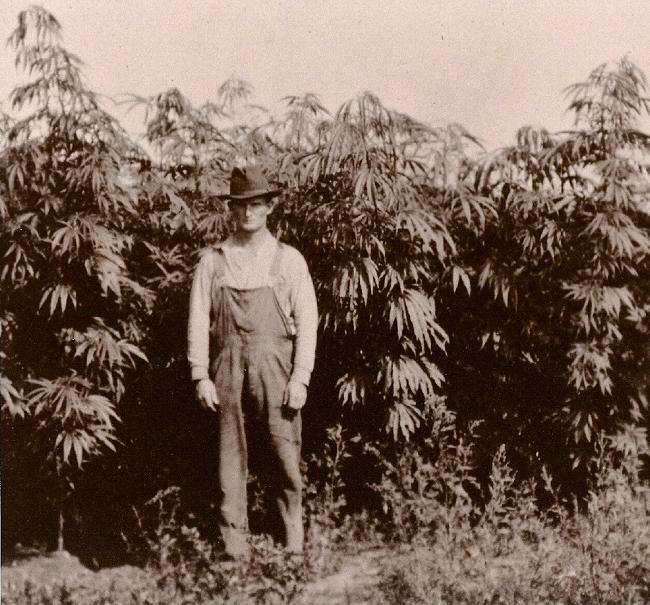 The United States Census of 1850 counted 8,327 hemp “plantations”* (minimum 2,000-acre farms) growing cannabis hemp for cloth, canvas and even the cordage used for baling cotton. Most of these plantations were located in the South or in the Border States, primarily because of the cheap slave labor available prior to 1865 for the labor-intensive hemp industry. *This figure does not include the tens of thousands of smaller farms growing cannabis, nor the hundreds of thousands if not millions of family hemp patches in America; nor does it take into account that well into this century 80% of America’s hemp consumption for 200 years still had to be imported from Russia, Hungary, Czechoslovakia and Poland, etc..
Benjamin Franklin started one of America’s first paper mills with cannabis. This allowed America to have a free colonial press without having to beg or justify the need for paper and books from England. In addition, various marijuana and hashish extracts were the first, second or third most-prescribed medicines in the United States from 1842 until the 1890s. Its medicinal use continued legally through the 1930s for humans and figured even more prominently in American and world veterinary medicines during this time. Cannabis extract medicines were produced by Eli Lilly, Parke-Davis, Tildens, Brothers Smith (Smith Brothers), Squibb and many other American and European companies and apothecaries. During all this time there was not one reported death from cannabis extract medicines, and virtually no abuse or mental disorders reported, except for first-time or novice-users occasionally becoming disoriented or overly introverted. From more than 1,000 years before the time of Christ until 1883 A.D., cannabis hemp, indeed, marijuana was our planet’s largest agricultural crop and most important industry, involving thousands of products and enterprises; producing the overall majority of Earth’s fiber, fabric, lighting oil, paper, incense and medicines. In addition, it was a primary source of essential food oil and protein for humans and animals. According to virtually every anthropologist and university in the world, marijuana was also used in most of our religions and cults as one of the seven or so most widely used mood-, mind-or pain-altering drugs when taken as psychotropic, psychedelic (mind-manifesting or -expanding) sacraments.